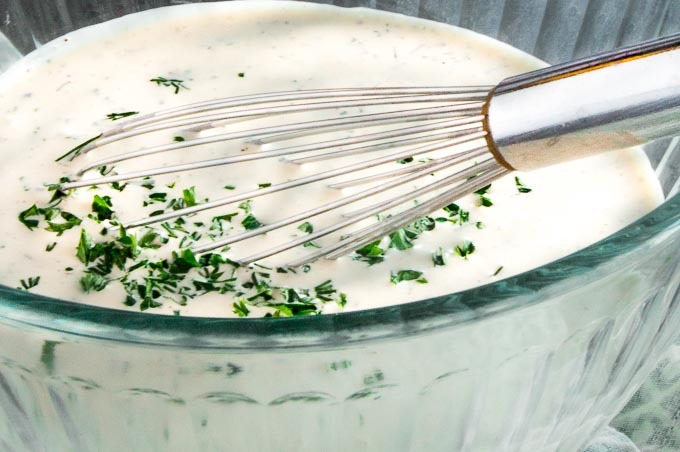 This Creamy tangy No Fail Ranch Buttermilk Dressing and Dip recipe is so easy you will wonder why you ever bought store-bought. Made with simple fresh ingredients to use on salads or dipping sauces for wings, chips or veggies! Creamy, Tangy No Fail Buttermilk Ranch Dressing and Dip is so easy to make you will wonder why you’ve never made it homemade before. Seriously, chop a few fresh ingredients and stir together and you have a delicious, creamy dressing for your favorite salad. This recipe is from my moms recipe cards. Most of her recipes came from magazines that she read but Im not certain where this one actually came from. I do know its so good that there are times when I see the jar of the Ranch Dressing in the fridge Im honestly tempted to eat it by the spoonful. So fair warning…. this ranch sauce is addicting! This recipe was requested by a reader (I can’t tell you how excited I get when people reach out to me!!) She wanted to know if I had the recipe to make her own Ranch dipping sauce for the Crunchy Fried Onion Rings recipe I have. I’ll be doing a whole series on things that I call Basics. Recipes for things you can buy store-bought but are easy to make homemade. Recipes that taste better and you feel good about making because you want to use fresh ingredients! Things like this Homemade Mayonnaise Recipe and a condensed Mushroom Soup Recipe that I will have up next week. I’ll give you the options in recipes to buy the store-bought version but if you want the recipe to make your own no fail tried and tested version! (Coming next week…. a Rustic Mushroom Rice Recipe that you use homemade Condensed Mushroom Soup made from scratch. What is in Buttermilk Ranch Dressing and Dip? Other than the buttermilk, you will probably have the ingredients in your pantry. I use fresh herbs, but the ranch sauce works just as well if you use the dried versions. What is the difference between a Ranch Dip and Ranch Dressing? There doesn’t have to be anything different at all between them. They are made of the same ingredients, but it depends on the thickness of the sauce, dressing or dip you are looking for. If you want a Buttermilk Ranch Dipping Sauce that is a little thicker for dipping wings and veggies into versus a light coating that you would want for a salad made of lettuce reduce the amount of buttermilk by half to one quarter cup. 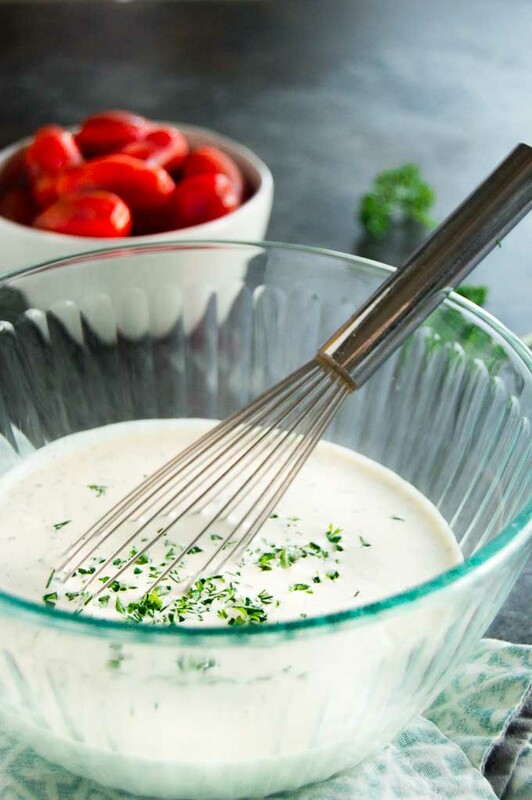 What can you use this recipe for Buttermilk Ranch Dressing and Dip on? PIN THIS for easy reference when you need an easy homemade dressing! 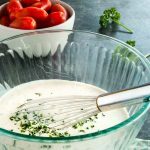 This Creamy tangy No Fail Buttermilk Dressing and Dip recipe is so easy you will wonder why you ever bought store bought. Made with simple fresh ingredients to use on salads or dipping for wings, chips or veggies! In a mixing bowl whisk together all ingredients. Store in an airtight container. Will last for up to a week in fridge. See notes for making this more for a dip than a dressing. If making this for a dip, reduce the amount of buttermilk by 1/4 cup. I make this at least an hour before I want to serve it. The flavors meld together and are more vibrant by waiting. This is so much better than bottled! I’m looking forward to trying it out on the many recipes you mentioned. Thanks!